If you love reading you'll know what it is to love a good book. And sometimes you can find love in unexpected places. So, with Valentine's Day just around the corner, why not enjoy a Blind Date With A Book? We've carefully gift-wrapped a selection of wonderful books and put them in various shops around Oundle. There are some clues on the wrapping but basically these books are surprise gifts for you to take home and enjoy. We hope they may introduce you to a new author or genre you haven't read before, and that you may find something you love. In any of the participating shops in Oundle just choose a book from the display. Save the surprise and don't unwrap it until you get home. Then read it, enjoy it and maybe fall in love. And yes, the book is yours to keep! 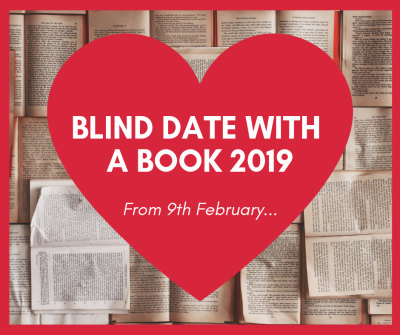 Blind Date With A Book is just a bit of fun for February - as well as being a celebration of books, and reading, and our wonderful public library too. So grab a free gift of a book and enjoy! Friends of Oundle Library exists to raise funds to improve Oundle Library and raise awareness of what it offers our community. Having a flourishing Friends' group also helps to prove Oundle wants its public library and will fight to protect it. If you'd like to join us please click here.